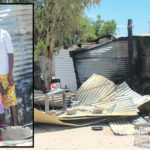 A FAMILY of six in the Oshakati West constituency was literally left without a proof over their heads for five days after a fire gutted their shack on Thursday afternoon. The head of the family, Nangula Kakololo, 46, stated that they only got visited by the Councillor of their constituency, Andreas Johannes, on Tuesday morning and were given a bag of Omahangu to keep them going for the day. Before the Johannes visit, Kakololo said, some individuals and family members offered them a helping hand by also providing them with food items, tents and blankets. The fire destroyed the shack around 15H00, after the family’s 4-year-old child lit fire matches. Although the adults from the house insist that they were in the vicinity of their shack, they said that they were only alerted of the fire when someone saw a smoke coming from inside their home. “I then rushed to the scene with a small bucket of water, but I could not contain the fire as it was already at the door,” said Kakololo. The family says that the local fire brigade was called, but failed to extinguish the fire as the water tank went empty. Family members lost all their belongings in the fire and they are now in dire need of clothing and bedding. 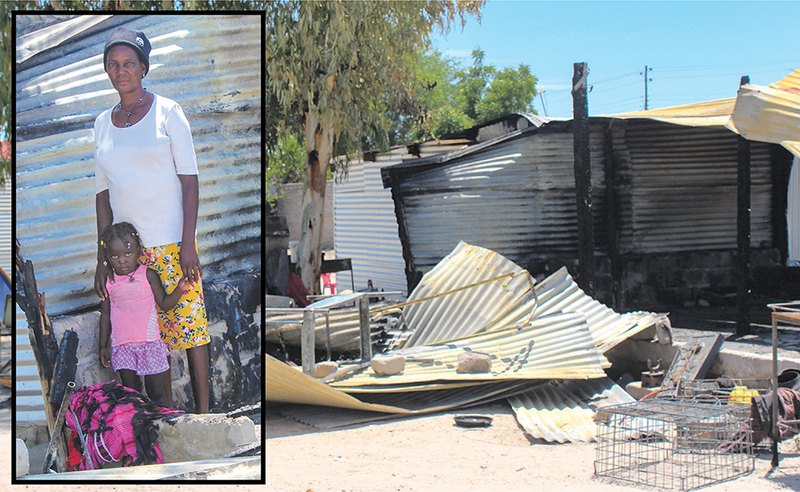 Oshakati Town Council officials, who visited the family on Thursday, have promised to offer assistance. The family will be sleeping in two tents until they rebuild their lives.